James Plourde: I am thrilled today to be with Dori Young and Kristin Barsness. The three of us, back in 2013 to 2015, worked on a $30 million campaign called Building Dreams Together, and the campaign was designed to promote and enhance children’s services. When we were working on the campaign, Dori was pretty new to the system. Kristin and I served as counsel to help guide the campaign. Since then, things have changed, but the lessons learned continue to live on. One of the unique aspects about this campaign is that it involved three entities of the health system. There was the neonatal intensive care unit which was at Tacoma General Hospital. 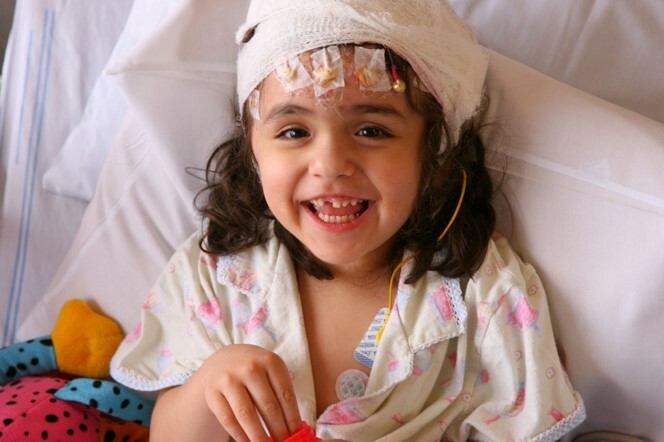 Kristin Barsness: The second was the Mary Bridge Pediatric ICU and also the Mary Bridge MedSurg Floor. And then the third entity was out at our Good Samaritan Campus in Puyallup, and it was building an endowment for the Children’s Therapy Unit. James: Mary Bridge and Tacoma General are co-located on the Tacoma campus, but Good Samaritan is in a smaller, rural community that, prior to this campaign, MultiCare had just a few years before acquired. There were some interesting dynamics there in terms of bringing that community into the overall MultiCare system, which I think was part of the campaign. When you look back, what do you think was the biggest success of the campaign and why? Kristin: I was counsel for the first year and came in just as the campaign was finishing. But looking back, I think that the biggest success was the planned giving work. It generated nearly $7 million of the goal and, in all but two of the gifts levels for the campaign, made the difference in filling out that gift level. It also gave the Foundations of MultiCare a huge turn in looking at the importance of planned giving. Not that we weren’t focused on it before, but since then, it’s become part of our annual goals every year. James: One of the things that we wrestled with is: what do you do with planned gifts in a campaign? How do you count them, do you count them, do you not count them? Kristin, I credit you as counsel, we came up with a system of how we would count those gifts. We had a mechanism for counting the dollar value of those gifts. Kristin: Right and recognizing them—we were really careful right out of the gate to make that clear for all our volunteers and to our staff. Dori Young: Planned giving hadn’t been a real focus for us in the past at the Foundations of MultiCare, so we made becoming proficient in that development work part of the campaign. And as a result of that, it has lived far beyond the campaign and become a really significant part of everything that we do. It just helped us think about it differently and learn a new practice in our day to day. Kristin: And I think a good campaign should do that—it should challenge us to buff up our own skillset and strategies. James: Absolutely. And even though Foundations of MultiCare is an umbrella organization, each of these entities had their own board, each of the hospitals had their own executives, so we really were trying not to run three separate campaigns. Kristin: We were running three or four campaigns. We were running individual campaigns at the three specific foundations and then an overall campaign to hold us together. Your question about “what are you most proud of?” coming up in the campaign, for me it seems like the way that we were constantly spinning plates. It was a huge orchestration across those three foundations. James: My perception is that when we started the campaign, there was a sense of each board wanting to raise the money for their particular entity. Toward the end, I really felt like every gift, for whatever aspect of the campaign, was championed and celebrated. Why don’t you talk about your perception there? Kristin: When you had three different boards coming together, they were all aware of what each other was doing. So there was a larger sense of appreciation from fellow volunteer leaders for what they were doing. Dori: It helped internally as well because it’s easy to stay in your own silo. And we are separate foundations, and yet we are all one staff. It helped us recognize that we could lean on each other and be very donor-centered without competing. James: Your point of comradery—there’s no other way to build that. We had those three separate foundation boards and then we went about building a campaign committee. One of the things that we were sensitive to was the fact that the campaign committee had to represent the interests of all three entities. Talk about how that got structured and the chairperson’s role for the campaign. Dori: We had a chairperson representing each of the three boards, and they were representing the cause from that board. For MultiCare Health Foundation, we had a board member whose child had been through our neonatal ICU for over 150 days. We also had a couple from the Mary Bridge Children’s Foundation and a husband and wife who were from the Good Sam Foundation. Those three sets of co-chairs took turns, they took a year, leading the steering committee. It meant that none of them had to serve for three years, they could rely on each other, they could pass the baton, and they were all recognized as leading the campaign. James: And they represented various elements of the campaign, but as the campaign went on, you got the sense that it was all for the same campaign. Dori: Absolutely. One was a physician and one of the couples were grandparents and had been involved for decades as volunteers, and one was a younger man probably in his early 40s. So we had an age representation, we had a topical representation, geographic representation. Kristin: And that structure really glued the entire campaign together in a significant way. It was a very real group of working campaign co-chairs that supported one another. And I think that message was carried back to each of the individual boards and committees. James: One of the things we always stress in campaigns is “think about how the community is going to be better $30 million later.” What would you say the lasting impact has been on the community? Dori: One of the facilities that was upgraded was the neonatal ICU—and Tacoma General has the capacity to serve 77 neonates at any given time. That’s crazy for a community of our size, but we draw from so many counties in Southwest Washington. So that lasting impact for families to have the resource right here is amazing. And we did increase our capacity but more importantly, each of those were private rooms, so even a mom who’s just given birth can be rolled into the room next to her baby. So this particular space is beautiful for the community. Kristin: What I’m most proud of is that this campaign made it possible for more kids to have access to specialty pediatric care. 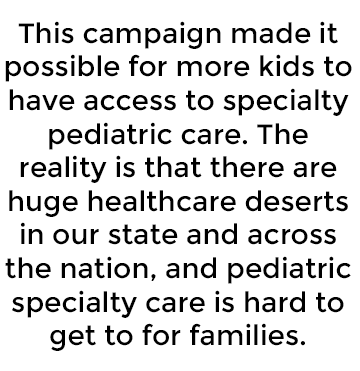 The reality is that there are huge healthcare deserts in our state and across the nation, and pediatric specialty care is hard to get to for families. There are three pediatric hospitals in Washington state, so if you don’t live near one of them, you have to travel. So it really did expand that access and ensure that quality specialty care is available. James: As you look ahead, what are the lessons learned that you would want to carry forward in a future campaign? Kristin: When you look at the results of this campaign, you can see how skewed our pipeline was. We had lots of gifts at the lower level, which you’re going to get in a campaign, but we had not worked on that before we got into campaign mode. Coming out of that, we’re very deliberately building a middle donor strategy. And we’re looking at how do you build that pipeline—truly growing that base of donors so that next time there will be new folks at every level. Dori: The planning and the preparation that went into that campaign really paid off for us, and it paid off in some tremendous efficiencies across our operational side, as well. The fact that we were able to find a sweet spot for all of those foundations to work together was really great.